Backyard Bats. Learn all about attracting beneficial backyard bats! Welcome to the Bluebird Landing Blog! Enjoy interesting articles and videos about what we have a passion for... Nature! ■ Bats are mammals. A long time ago, people used to think bats were birds without feathers. Now we know that bats are Mammals, just like people. Some things which tell us bats are mammals: 1) Bats are warm blooded 2) Bats nurse their babies with milk 3) Bats have fur. 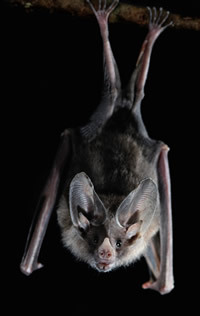 ■ Bat wings are made of two thin layers of skin stretched over the bat’s arm and fingers. Bats have a thumb and four fingers, just like people. Bat fingers are very long compared to its body. If we had fingers like a bat, they would be longer than our legs! ■ Scientists have found evidence that bats have existed for 50 million years. ■ Bats smell, hear, taste, feel and see just like people do. The term “blind as a bat” isn’t really accurate. Bats have perfectly good eyes for seeing in the daylight, but they do most of their hunting at night. They make high-pitched squeaks called ultrasounds which bounce back to tell them where an object is. This is called echolocation. ■ Bat females have baby bats called pups. Like people, they usually only have one baby at a time, but on occasion they’ll have twins.